We told you a little while ago that the GV Mobile Google Voice app had been resubmitted to Apple, hoping to make its triumphant return to the App Store and iOS devices. While we have had heard nothing since, today we got our hands on a new Google Voice app called GV Connect. 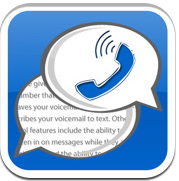 GV Connect features a slick interface, and apart from push notifications, includes everything you could ask for in an unofficial Google Voice app. You can grab the GV Connect ($2.99) app from the App Store here. • Place calls using your Google Voice number rather than your mobile number – enter number directly, select a contact from your device’s contacts, or call back any number in your history. 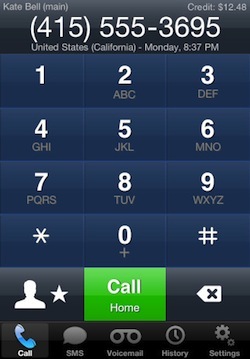 • Send and receive text messages (SMS) from your Google Voice number. • Listen to voicemails and recorded conversations right on your device (allowing you to pause, rewind, or fast forward to any point within the message) – voicemails will also show the transcription of the message when available. • Mark messages as starred, attach notes to conversations, block/unblock senders, or delete conversations. 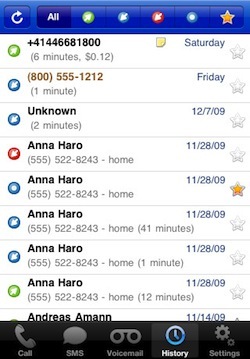 • Easily search in your history by contact, message, or note. • Messages are stored on your device for offline access. • Composing notes and text messages can be done in landscape mode. • Quickly change various Google Voice account settings (call forwarding, do-not-disturb, message notifications, …) directly from within the application. • Automatic checking for new messages while the application is active. • All communication is done with the Google Voice website directly, no need to hand over your account information to a third-party. • Full support for fast app switching in iOS4 and high-resolution graphics for retina displays.